In a particularly quiet position with panoramic view over the Dolomites, unforgettable culinary delights and an excellent service. Welcome to Hotel Ratsberg*** in Toblach! The Hotel Ratsberg is located in a very tranquil and sunny position at 1,650 meters above sea level. Therefore it is characterized by a unique panoramic view that stretches from the Dolomites over the valley of Pustertal to Toblach and Lake Toblach. Our house disposes of altogether 29 spacious and stylishly furnished double, comfort and single rooms, which are furnished with modern comfort, bathroom with shower and WC, satellite TV, radio, phone and safe, partly with winter garden or balcony. In addition you can use the spa area with panoramic indoor pool, sauna, whirlpool and lawn for sunbathing. 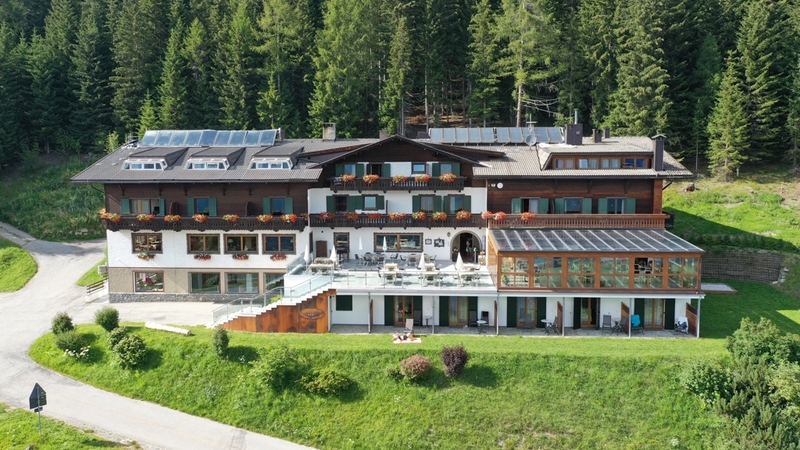 It is quite obvious that mountain friends, hikers, climbers and bikers like Toblach and environs, because the enchanting mountain scenery around the Hotel Ratsberg is full of pleasant, challenging and exciting tours for the whole family. The Stauder family and the Ratsberg team are looking forward to see you soon! Our single rooms are comfortably furnished with TV, phone and radio. Each comes with a bathroom with toilet, bidet, shower and hair-dryer. All rooms have a safe and a balcony with a breathtaking view over Toblach and the surrounding mountains. Our double rooms (ca. 20 sq.m.) are comfortably furnished with TV, phone and radio. Each comes with a bathroom with toilet, bidet, shower and hair-dryer. All rooms have a safe and a balcony with a breathtaking view over Toblach and the surrounding mountains. The comfort rooms (ca. 27 - 29 sq.m.) are generously furnished with TV, phone, radio and some with a safe. They all come with a bathroom with toilet, bidet, shower/bath tub and hair-dryer. A cosy lounge that can, if needed, be used as an extra bed, is a perfect solution for children. All rooms have a balcony with canvas chairs and others a winter garden. Some rooms have a terrace with beach chairs. Depending on the position, you have a breathtaking view over Toblach and the surrounding mountains or our forest.